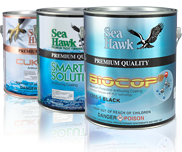 When it comes to antifouling and ablative boat bottom paints, you can trust Sea Hawk Paints to deliver high-quality marine coatings and premium service backed by our Customer Covenant with a written guarantee. Sea Hawk Paints is testing more than 600 innovative bottom paint formulations that will become the next generation technology for the boat bottom paint & marine coatings industry. Using only the best ingredients, like premium domestic copper, virgin grade solvents and rosins and higher pigment content, Sea Hawk Boat Bottom Paints are proven to outperform other bottom paint by 30%. that's right for your boat.